practically anything. They also love to take baths. Conures require a large amount of physical attention. At least one hour or more of daily interaction. Most Conures are very noisy and can be loud especially at dawn and dusk. but generally are not good talkers. 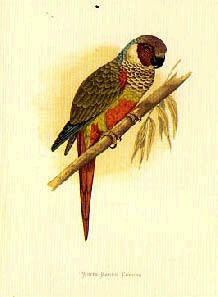 and subspecies of Conures have been identified. there is a wide range of other colors. on the cage floor or feed bowl. Minimum cage size is 8"W x 22"L x 24"H.
to help keep a Conure's feet healthy. Keep a cuttle bone or mineral block in the cage at all times. Conures should always have access to clean, fresh water.